Definition: As used in this drill, the word origination means something voluntarily said or done unexpectedly by a person concerning himself, his ideas, reactions or difficulties. Purpose: To teach the student not to be tongue-tied or startled or thrown off by the originations of another and to maintain good communication throughout an origination. People frequently say the most astonishing things and take you completely by surprise. Almost every argument you have had was because you did not handle an origination. If a person walks in and says he just passed with the highest mark in the whole school, and you say how hungry you are, you’ll find yourself in a fight. He feels ignored. Handling an origination merely tells the person you’ve heard what he said. This might be called a form of acknowledgment, but it isn’t; it is the communication formula in reverse. The person you were speaking to is now the cause-point of the communication and is speaking to you. Thus you now have to handle this origination and once again resume your role as cause-point to complete the original communication cycle. 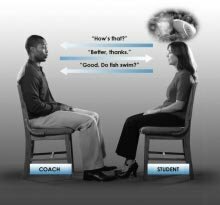 Commands: The student asks the coach, “Do fish swim?” or “Do birds fly?” Coach answers, but now and then makes startling comments from the prepared Origination Sheet provided here. Student must handle originations to satisfaction of coach. 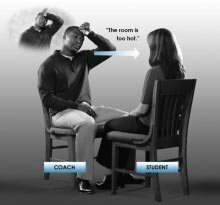 Position: Student and coach sit facing each other at a comfortable distance apart. Training Stress: The student is taught to hear origination and do three things. (1) Understand it; (2) Acknowledge it; and (3) Return the person to the original cycle of communication so that it can be completed. 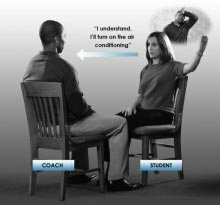 If the coach feels abruptness or too much time consumed or lack of comprehension, he corrects the student into better handling. 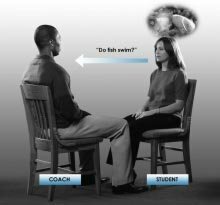 Patter: All originations concern the coach, his ideas, reactions or difficulties, none concern the student. Otherwise the patter is the same as in earlier training routines. The student’s patter is governed by: (1) Clarifying and understanding the origination, (2) Acknowledging the origination, (3) Repeating the question. Anything else is a flunk. The student must be taught to prevent upsets and differentiate between a vital problem that concerns the person and a mere effort to divert him. Flunks are given if the student does more than (1) Understand; (2) Acknowledge; (3) Return the person to the original cycle of communication. Coach may throw in remarks personal to student as on TR 3. Student’s failure to differentiate between these comments (by trying to handle them) and coach’s originations about self is a flunk. When the student can smoothly handle originations without being startled or thrown off and can maintain good communication throughout an origination, he has passed this drill.